A small group of similar but also highly individualized masks from Timor is noteworthy for the masks' great age and their simple, sometimes raw, but always evocative facial features. Given the long period of time over which they were used, these masks always display varied surface areas. Usually, they consist of hardened layers that are partly granulated, in combination with areas that exhibit a glossy black patina. Such rich and complex surfaces can be naturally created only by a combination of handling and extended contact with the smoky interior of a traditional house. It is said that biola were worn during ceremonial dances and used for traditional practices revolving around a village's ceremonial house (uma lulik). Otherwise, they were stored in the attic or among the rafters of the uma lulik. At some point, masking traditions in Belu, as well as in other areas, seem to have fallen into disuse. While a few latter-day photographs depict dancers wearing masks, the names of older masks, their origins, and detailed knowledge surrounding their functions are now little understood. This may result from the transformation of their meaning within the culture, the reappraisal of their use and value after the region's pacification by the Dutch, the cessation of headhunting, and the introduction of Christianity. The masks were worn in conjunction with a number of ceremonial dances, including the loro'sae. Originally a war dance, this celebrated ritual, with its entrancing rhythms and intense crescendo, culminated in the decapitation of prisoners at sunrise. When Margaret King saw this dance performed in 1960, she wrote that an event that had once been tied to headhunting had now become a vibrant celebration of village life. Today, such dances as loro'sae, the likurai, and the tebedai are still strongly bound to local identity, as well as having become cultural attractions. Since independence, loro'sae, which means "rising sun" in Tetun, is that community's name for modern East Timor (Tmor-Leste). This mask is one of the finest and most expressive examples known. Its raised brow, straining appearance, and open mouth are suggestively combative, much like a warrior's facial expressions in the midst of shouting or singing chants of aggression. Old nails and indentations for wooden pegs are signs that it was once crowned with hair and adorned with a beard. 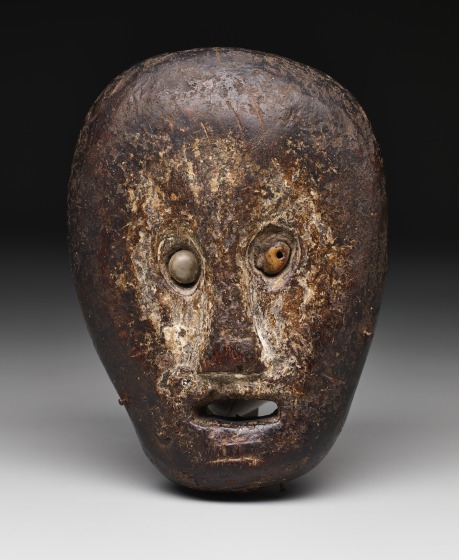 This mask also possesses an extraordinary set of shell eyes, one gray, one an opaque orange. Set in a profusion of hair and framed by a black background, the mask's whitened face would have added a final flourish to its theatrical impact. Steven G. Alpert, "Ceremonial mask (biola)," in Eyes of the Ancestors: The Arts of Island Southeast Asia at the Dallas Museum of Art, ed. Reimar Schefold in collaboration with Steven Alpert (Dallas: Dallas Museum of Art; New Haven and London: Yale University Press, 2013), 256-257.